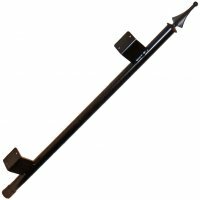 Screw mount "Wall" pole (1" OD with heavy duty .060 wall) with removable Plastic Finial Spire. 24" in length. 1/8" Thick standoffs extend pole 2-1/4" from window frame or wall. All Erva Tubular pole accessories and attachments work with this pole. Add an extender - or drop in a multi arm pole topper to complete your unique assembly. This is an exclusive Erva product and the only item of its kind on the market!